In 2013, Sean Creagh returned from a four-year stint working in a Spanish pub weighing in at around 20 stone. On his retirement, the questions that spring to mind are: How? Why? In my earlier teens, I played Gaelic football and I was always a bit heavy but it was never a problem. Then I moved to Spain when I was 18 and I was working in the pub. I began eating and drinking – generally partying – and that’s when the problems started. I was training but the food intake and the lifestyle was all too much. It was four or five years of abuse for my body and I put on about eight or nine stone in that period of time. It’s crazy to look back on it and I don’t know how I let myself get like that. I guess I was just young and silly. Luckily for me, the gym and the pub I worked in were kind of one family. They’d come get me and bring me to the gym and push me to train for my own sake. I obviously didn’t see what was going on but they were able to spot the worrying signs of obesity kicking in. I probably would have got to the stage of a heart attack, if I’m honest. If the lads in Spain weren’t pushing me to be healthier, I could’ve ended life early. I didn’t really see it but when I started training and losing a bit of weight, I realised. The only time you see how heavy you are is when you start trying to lose it. I moved back home to Ireland in late 2013. I wasn’t trying to lose weight but I was eating cooked meals at home that my Mum was making me. She had me on a secret diet! She’d seen the warning signs. I’d done a bit of white collar boxing in Spain and had a passion for it so I went down to a local boxing club. I asked Steven Kavanagh if I could join and he said yes. I wanted to fight but he told me I was too heavy. I was 120kg. I got down to 90kg and thought I’d have a go but he told me I was still too heavy and wanted me down to 75kg. I got stuck back into training. That’s when I really gave it a go. I got down to 73kg and entered my first competition. It was a multi-county tournament in Ireland and I went on to win it. I loved that and wanted to compete at my own weight. I got down to 71kg for the next tournament and won the Dublin and Leinster novice tournaments. Dublin then told me they wanted me on a team to go to Boston but I had to get to 67kg. I went over there and won all my fights. I didn’t plan any of it and at the time it wasn’t easy. Those are stories of success but of course there were dark days too. There were some days I didn’t want to get out of bed and I certainly didn’t want to train. I’d think: ‘I’m fat and that’s it.’ I’d beat myself up if I’d had some food I shouldn’t have had. The people in Spain really helped me and so did family and friends at home. You just need a good team around you to drive you. I’d encourage people who want to lose weight to hire someone to train them and motivate them. Investing in yourself is money well spent. You have to remember – there are dark nights but the bright mornings always follow. You have to push on through. There’s always going to be temptation. Drink and food – I still love it. I have to control my eating. I’ll be eating and I have to remind myself that I’m full. It’s a constant battle and it’ll never go away. I eat impulsively. I could go to the kitchen right now and eat 10 packets of cookies and I wouldn’t be full. It’s like sleep-walking. I just binge eat. The only time I relapsed was after I fought Tyrone McKenna for the Celtic title. I got a bad bicep injury. I was so depressed. I couldn’t train and I thought my career was over. I just sat indoors and ate. Then around a month before Christmas I started walking and eating less. That was probably the only time I went back up to 85kg. Even now I’m retiring now, I see training as part of my life. I still train twice a day. I do cardio and weight training. It’s just part of life. If anything, I’ll have to train more now I’m not fighting. I have to keep a constant eye on it. I can be a bit more relaxed around some foods because I’m not in camp. I still have a nutrition coach and I’ve got a better relationship with food. Once a week, I’ll go out and enjoy a nice meal but nowadays, I love training. I was working as a nutritional coach and as a personal trainer but I’m moving to Canada now. I might get back into it there or I might do something else; we’ll see. I’ll have a coach wherever I am because I need accountability. I eat slowly and I eat mindfully. I have to control my environments. I have to stay active while I’m travelling and I’m looking forward to the challenge of living a normal life. I won’t be making the super-lightweight limit again but I’m happy! I don’t think I’ll let myself get up to the kind of weight I used to be. The sport of boxing saved my life. 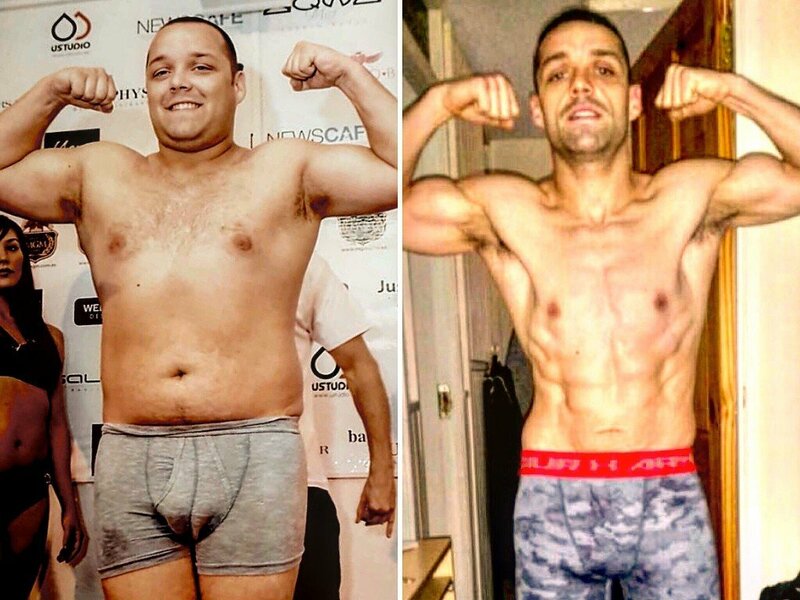 I look back on my journey and I was 125kg on the scale for my white collar fight. My friend I was living with at the time had to have me barred from the curry houses. He treated me like it was a professional training camp – it was great! I had a serious training camp because before that, I was around 135kg. I don’t think people need a catalyst like boxing, though. I’m very competitive and I love to fight. Even when I was 125kg, I’d do 10-12 rounds of sparring without a problem. People need to find something they love enough to do for long periods of time. If you pick training that you love to do and a diet you can see yourself doing for the next four or five years, then you can set small goals in the interim and succeed. I need to find something else competitive. I might do CrossFit or an Iron Man… Everyone needs to find something sustainable and something they love. It’s then that the magic happens. If anyone wants any help or guidance, I’m always there on social media or WhatsApp. I’m here to answer any questions. I hope my story inspires even just one other person to do what I did. It would make me the happiest person in the world. Previous boxing news: A Sparring Partner Talks: Deontay Wilder Hits Six Times Harder Than Anthony Joshua!